Les Canadiennes opened the season in their new home: Place Bell in Laval. Photo Elisa Barbier. Captain Marie-Philip Poulin was all smiles ahead of the game as she shook the hand of each of her teammates in the opening ceremony. The team could not have been more excited to be making their season debut in the atmosphere of Laval’s Place Bell, which they now call home for the season. On hand for the ceremonial puck drop in their new home was Caroline Ouellette, who also made her debut behind the bench in her first regular season game with the team— this time in a new role as technical coach—since announcing her retirement earlier this month. Both teams came into this game on pretty even playing field, Montreal finishing the regular season a few points ahead of the Inferno last year, and Calgary beating them out in the playoffs finishing in third, two points ahead of Les Canadiennes. 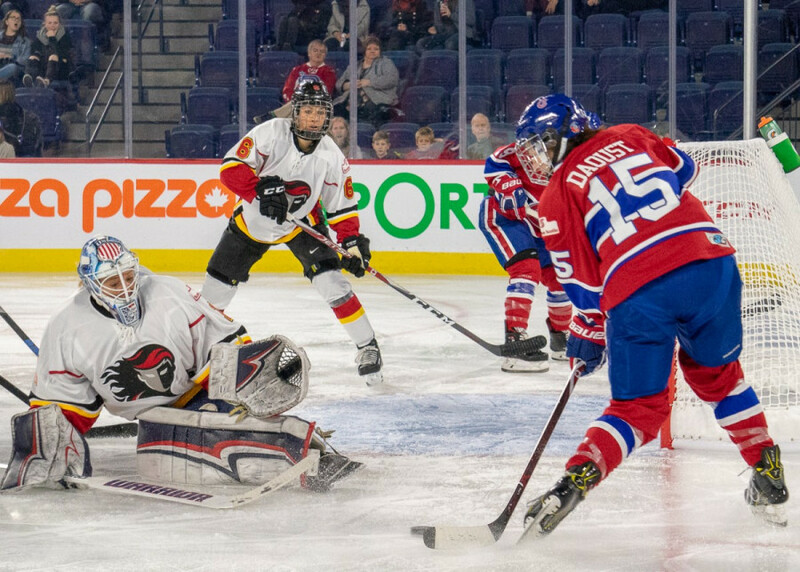 Les Canadiennes and the Inferno each have star-studded rosters to boast, with Calgary dressing 13 olympians and Montreal with six olympians, and three national team players. It was bound to be a battle for the ages, even in the first game of the season. Marie-Philip Poulin (#29) returned after a year away from the team for the Olympics. Photo Elisa Barbier. Les Canadiennes were working with a host of new faces, including rookie Catherine Daoust, former Calgary Inferno forward Jillian Saulnier, and Maude Gelinas who made her return to hockey after a two year absence. This left the team with a few kinks to iron out, but overall managed well, due in part to the presence of strong leadership among veteran players. 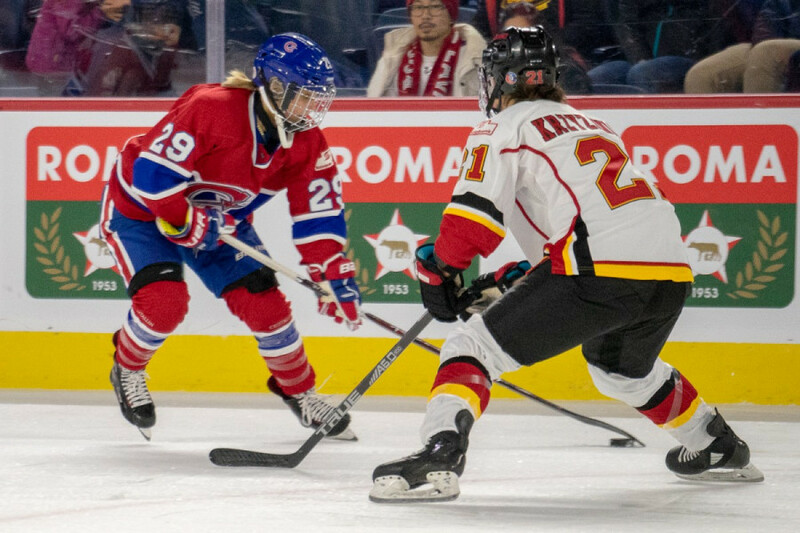 The Inferno sent a message to Les Canadiennes early on, surprising their opponents by starting the game with four forwards. The team had to adjust quickly to the Inferno’s offensive tendencies, something they were ultimately successful in, and they themselves had a few good chances at creating offensive chemistry. Calgary opened scoring with Brianna Decker going top shelf over Les Canadiennes’ goaltender Emerance Maschmeyer’s blocker. Les Canadiennes followed up not too soon after, evening the score with Gelinas tallying her first goal of the regular season. Gelinas says she’s not a goal scorer, however she’s managed goals throughout the preseason, and now the regular season. The second period would see little action, with neither team being able to capitalize on scoring chances enough to take the lead. In Les Canadiennes’ case, the effort was there and they were doing everything in their power to try to put that puck in the net, but it just didn’t seem to want to go in. This was due in part to Inferno goaltender Alex Rigsby who had an incredible night, making 18 saves on 20 shots. The final frame saw a battle to the very end, both teams held strong both offensively and defensively with chances on either side. However, it was Les Canadiennes’ night. Hilary Knight moved the puck up to Saulnier who put it on the net; the puck bounced off Rigsby’s pad and Sarah Lefort was there to tap it in for the game winning goal. With this win, Les Canadiennes are able to shake off some of those first game nerves and get to work on building some momentum for the remainder of the season. The team will play in three home arenas this season. Photo Elisa Barbier. “This was the first time we played together and there were some nerves and some excitement, a lot of different communication that we have to work out,” said Knight, who has returned for her first full season with the team after signing late last year. “It feels great to win, and at the same time we figured out what works and what doesn’t work and we’ll go back and try it out tomorrow, and we’ll see where we are,” she said. Now, the team looks to their next challenge as they face off against the Inferno yet again, and this time the Inferno will be looking for redemption. 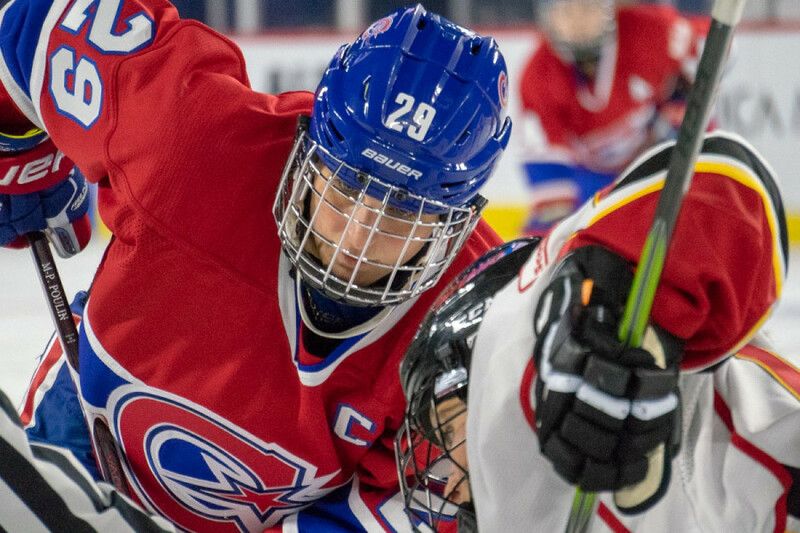 Les Canadiennes hope to leave this weekend series with a 2-0 record, when the take on their opponent on Place Bell’s community ice surface this Sunday at 1:00 p.m.